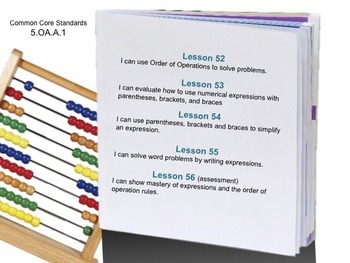 Week 11 Lessons 52 - 56 Covering using order of operations, writing expressions, using parentheses brackets and braces, writing expression from word problems using the order of operations, and a final assessment. 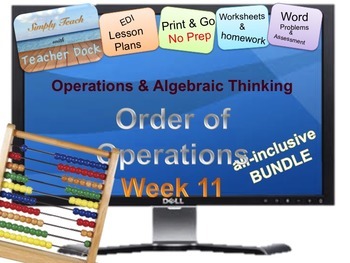 5th Grade 5.OA.1 Common Core EDI Lesson Plans, Worksheets, Homework, Assessment, CRA Constructed Response Assessment, Small group activities, Number talk guide, HOT's Guide all bundled for $3. All written, classroom tested and designed by actual classroom teachers, Jill and James! Explicit Direct Instruction Format easy enough for a substitute or anyone to teach. Semi-scripted for ease of teaching. Teacher guides to help explain concepts and modeling. Great not only for the regular classroom, but also for interventions, resource, Special Ed, Homeschool, tutoring, etc. Created with Microsoft Word 2011 so you can edit to your needs, cut and paste to your lesson plan format, etc. If you have an earlier version of Word, I will email you the lessons in a PDF once you make a purchase. PDF now included for every page.